Edith's checkerspot (Euphydryas editha) shows variation in both its color and the host plant for its larva. It belongs to the family Nymphalidae, which includes all of the brush-footed butterflies. 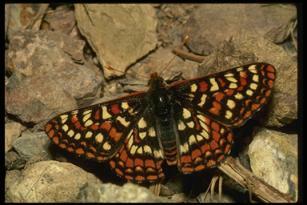 Edith's checkerspot has a wingspan of approximately 1-2 inches (2.5-5.1 cm). It looks very similar to some of the other checkerspots (e.g., anicia, colon, and chalcedon). After seeing one, it isn't hard to determine how the checkerspot butterflies were named - they have a checked pattern on their wings. Edith's checkerspots range is from parts of Canada (e.g., British Columbia, Alberta) and the Western United States. It is usually found in coastal areas, open fields, evergreen forest, and meadows. Normally Edith's checkerspot is found in both the north and the south, however, butterfly researchers have recently noticed a northward trend for this butterfly. Researchers believe that the checkerspots move northward may be due to global warming and/or habitat destruction. As their host plants are destroyed due to climate changes or land development these butterflies are moving north to find available host plants for their larva, as well as nectar sources for the adult butterflies. Endangered - a species that is in danger of becoming extinct throughout all or a significant portion of its range. Threatened - a species that is likely to become endangered in the near future. Candidate - a species that is likely to be added to the threatened or endangered list in the near future. Butterflies are highly susceptible to climate changes and so they serve as good barometers of the state of our environment. As more and more butterflies become endangered we know that our environment is deteriorating. The primary host plant for Edith's checkerspot is plantain (Plantago spp.). Other host plants include Indian paintbrush (Castilleja spp. ), owl's clover (Orthocarpus spp. ), Penstemon, and lousewort (Pedicularis spp.). Adult female Edith's checkerspots lay their eggs in clusters on leaves. The caterpillar is mostly black with orange. It has black spiny projections coming from its body. The chrysalis is white with orange and black markings. Adult Edith's checkerspot butterflies feed on flower nectar, especially the flowers of spring gold (Lomatium utriculatum), which is also becoming more scarce and difficult for Edith's checkerspots to find.